Travelers Insurance Payment for Commercial Hail Damage | The Voss Law Firm, P.C. ?How can my business maximize a hail insurance claim? ?When is an insurance company acting in “bad faith” during the handling a commercial hail insurance claim? Texans are no strangers to severe weather, especially the violent and destructive hail storms that sweep through the state each year. If your business is relying on commercial property damage coverage through Travelers, you may be shocked to discover how little you receive for your claim. Attorney Bill Voss examines the various business insurance plans offered through Travelers, allowing policyholders to prepare themselves for the long and frustrating claims process. Travelers offers particular assistance to business owners who make hail-related claims, and assures policyholders that its field officers undergo training programs to assess hail damage. For instance, claims professionals are advised to review weather reports to confirm that a hailstorm passed over your business, as well as determine how large the hailstones were in your area. The insurer also allows that the degree of damage caused during a hailstorm can vary widely from structure to structure, so an evaluation of your roof by a Travelers agent is necessary to determine the value of the claim. Property damage. Travelers business property damage coverage may be used to replace a damaged roof, repair damage to the landscape (such as trees or signage), and replace lost inventory that was damaged by wind or rain. Auto damage. Comprehensive auto coverage covers any damage to your vehicles that is not related to a collision, including hailstones or even a tree falling on your car during a storm.﻿﻿ This coverage will also typically pay for flood damage to a vehicle, which is difficult to recover under standard policies. Business income. This insurance provides payment for business revenue that has been interrupted due to a covered event. With business income insurance, owners can continue to pay their normal operating costs during the time that they are closed due to repairs. Some policies may include extra expense coverage, which will provide payment for expenses that are incurred in order to minimize the period in which the business is not fully operational. Once you file a commercial property claim, Travelers will assign one of its claim professionals to evaluate your coverage and the damage to your business. The claims professional is responsible for providing an estimate of all of your damaged items and losses, and has the ability to issue a check to resolve your claim at any point after the inspection of your property. Save all receipts for purchases made to make necessary temporary repairs so that you can be reimbursed for these costs. Create an inventory of all lost and damaged property. Separate all damaged property from undamaged property (including computers, inventory, stock items, tools, furniture, and other tangible items). If you rent or lease the property, notify your landlord of any losses and your intent to file a claim as soon as possible. Examine your policy carefully to determine if a landlord may be responsible for any costs, including repairing the damage to the building or any code updates or improvements made to the rental space. If you are liable for necessary repairs, you may hire an insured and bonded contractor to estimate the amount of repair costs. 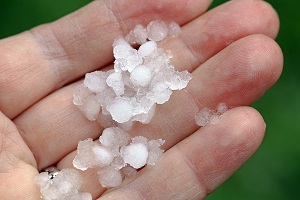 Unfortunately, many commercial hail claims are denied or underpaid in order to save the insurance company money. At the Voss Law Firm, we represent policyholders who have paid their premiums faithfully for years, but were denied coverage when they needed it most. If you are struggling to collect fair payment from an insurer after a storm, we can help. Simply fill out the contact form on this page today or order a free copy of our book, Commercial Property Owners Must Read This BEFORE Filing an Insurance Claim.